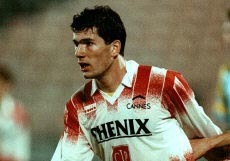 Zinedine Zidane was just one of many young boys who lived in France who had a dream. Born 23 June 1972 in Marseille, in a poverty driven district where many immigrants would migrate to, as a young boy he always wanted to become a footballer. At the age of ten he joined a junior football squad at ‘US Saint-Henri’. All he ever wanted to do was play football. As time grew on he gradually moved on to ‘SO Septembes’ then eventually by the time he was seventeen he made his 1st team debut at ‘Cannes’, a young man with a great touch and much more advanced than any other kid his age. By that time he wasn’t the great player he is now, but he had much knowledge of the game. He wasn’t the strongest and he most confident. All he knew was that he loved playing football although it had to take a psychologist to input confidence in him. In 1992 he then went on to play for ‘Bordeaux’, where there he developed strength, courage and supreme confidence. Four years from there in 1996 he moved onto the big Italian giants ‘Juventus’, in those days Seria A was the best league. His first few months weren’t productive, playing in a defensive midfield role and he struggled to be in the starting 11. Eventually as time went by he was placed in a more offensive role were the real Zidane started to show. This is where he truly started to develop into a world class player. He helped them to win the Seria A title twice. In 1998 the world cup had come up and by then Zidane’s name was all over the press to be the star of the show for France, even though everyone backed the great Brazilian giants to win it. France progressed to be in the final; the first time that France had ever reached the world cup final. Although Zidane had a bad tournament it was in that game that the ‘maestro’ had come to life. The game was going on but nothing had happened for 27 minutes, until out of the blue cue Zinedine Zidane with a rare header. Then again just before half time he scored another header to make it 2-0. By the end of the game, France had won by 3-0. In 2001 France once again hosted the European championship, where Zidane helped them to win that and became the second team to retain the world cup and the euros. By that year he had moved from ‘Juventus’ to join the great Spanish greats ‘Real Madrid’. Although Zidane had some anger issues he was a man of pride. When he joined Real Madrid, in his first season he reached the champions league final where Zidane showed his absolute brilliance and scored the final goal which finished off 2-1 to Madrid against Bayern Leverkusen. He spent five seasons at Madrid where there he was an illustrious architect and always showed his grace in the game. Even if Madrid didn’t win, you always knew that Zidane would put on a show for the fans. In 2006 world cup, Zidane decided that he wanted to retire after the world cup; Zidane pushed the team on and helped them reach the final again after helping them take out some big national giants such as Portugal, Spain and Brazil; where in the final they met the great Italians, this is where he made the most controversial decision of all time, he had head butted a defender. France went onto lose that final, possibly the worst way that he wanted to end his career. Although everyone criticized him at the time everything he had done in his football career overshadowed that moment. Zidane’s skill control and absolute elegance in his game was one of a kind. A man of little words offs the pitch, but on it, he was fearless.